The Christmas edition of Coles Little Shop kicks off this weekend – and shoppers can claim a bonus mini in addition to any earned from buying groceries. From today (December 7), Coles customers can again collect one Little Shop toy for every $30 spent in store or online. But on Saturday and Sunday, shoppers can earn a bonus Christmas collectable when they buy any News Corp newspaper. News Corp newspapers include The Courier Mail, The Daily Telegraph, Mercury, Herald Sun, The Advertiser, NT News, The Sunday Mail, The Sunday Telegraph, Sunday Tasmania, Herald Sun Sunday, Sunday Mail and Sunday Territorian. A limit of one bonus toy per paper purchased applies, and there’s also a maximum of four bonus minis that can be received per transaction. The offer excludes Western Australian stores, Coles Online and Coles Express. If you’ve been living under a rock and have no idea what Coles Little Shop is all about, it’s one of the most popular and successful marketing campaigns Australia has seen. The original Little Shop promotion ran between July and September, with 30 miniature grocery items to collect, including Weet-Bix, Milo, Vegemite, Nutella and Tim-Tams. And now it’s back with a limited-time Christmas edition, with five festive mins to collect. This weekend’s News Corp newspaper offer is a good way to get your Christmas collection started, but try not to go too crazy and buy things you don’t really need or want just to get them! The Coles Little Shop Christmas edition runs from Friday December 7 until Christmas Eve, December 24, or while stocks last. There are five Christmas edition minis to collect, including Coles branded Pavlova, Christmas Crackers, Deep Filled Fruit Mince Pies, a Gingerbread cookie and Gingerbread Ice Cream. You’ll also find a collector’s case in the shape of a Christmas stocking for $4 to house your new minis. Coles has also revealed a DIY collector’s case on its website that can be downloaded, printed and assembled at home. 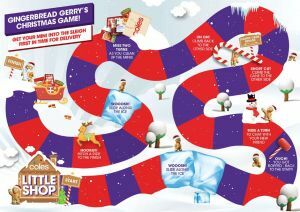 And that’s not all, Coles has also created a Gingerbread Gerry’s Christmas game (pictured) that can be printed out and played with the Christmas minis collected. Coles has also left the door open to potential Christmas Little Shop swap days – but there are no specific details yet.